100 years ago today, the first major battle fought by Canadian soldiers during World War I began. The Second Battle of Ypres occurred between April 22 to May 25, 1915. Despite being outnumbered and outflanked, the 1st Canadian Division held off the advancing German lines long enough for the British and French reinforcements to arrive and ultimately win the battle as a whole. This victory was not without a steep cost though—and I’m not just talking about casualties. What took place had a tremendous effect on the rest of the war. Map of Ypres Salient. The shaded area represents where the heavy fighting took place. (Click map for a bigger image). The men who made up the 1st Canadian Division were the earliest volunteers; the optimistic ones who believed that the war would not last that long. They had only briefly experienced trench life before being order to the front lines on the Flanders plains, the Ypres salient (east of the Belgian city of Ypres). Ypres was a key location due to its rail and road links to coastal ports. Also, the city was the last major Belgian stronghold that had not fallen to the Germans. The Allies were determined to maintain their position and deny the Germans of what would have been a crucial victory. 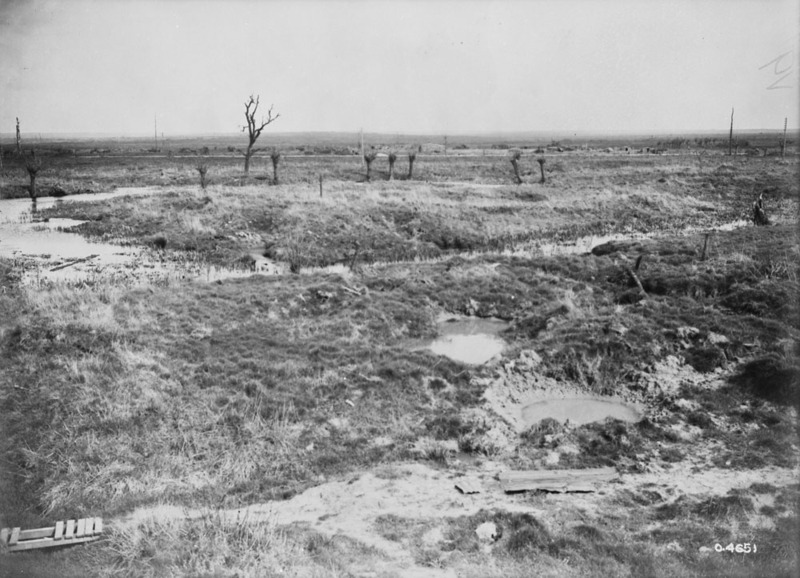 Ypres field prior to the battle (1915). When the Canadians arrived, things were already pretty awful. They were surrounded by the enemy on three sides. The Germans were on higher ground too making the Allies easier targets for snipers. The trenches were shallow, horribly constructed, and full of water. Also, they were littered with corpses of soldiers who recently died but had yet to be properly buried. Luck was on the Canadians’ side though when the battle started and the Germans released 168 tonnes of chlorine gas on April 22nd. It was not the first time the Germans had used gas, but it was the first time it had a lethal effect. The thick yellow-green chlorine clouds stretched 6.5 km and the wind blew it towards the French-Algerian soldiers to the left of the Canadians. Thousands of men suffocated to death within 10 minutes. This led to a panic and many Algerian soldiers tried to flee the scene—they didn’t get too far though, movement aggravated the effects of the gas. Chlorine burned their throats and caused their lungs to fill with foam; essentially; these men were essentially drowned by their own bodily fluids. An aerial shot of what the gas attack would have looked like. Please note this picture was taken during the Battle of the Somme (1916). 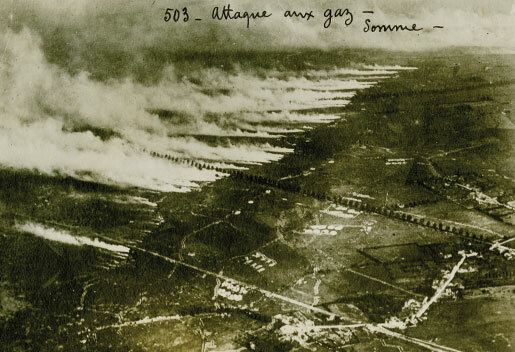 [Source] During both Ypres and Somme, miles of gas cylinders were lined up across the battlefield and released at once. During Ypres, 5,730 cylinders released 168 tons of chlorine gas. The Algerians suffered 6000 casualties from that one attack alone and the panic created a 6+ km hole in the Allied lines. The Canadians rushed to fill that gap. To counteract the chlorine, the soldiers urinated on handkerchiefs and held it to their faces. They were able to hold the line and the Germans only gained 3.25km before digging in for the night. Fun Fact: John McCrae wrote a little poem called In Flanders Fields during the Second Battle of Ypres. Took him only 20 minutes to do so…now that’s talent! To put it bluntly, the Germans were pissed. This marked the first time a colonial division successfully held off a European power on European soil. As such, with the next battle the Canadians were the main target. Not only did they have to deal with another massive gas attack, but an onslaught of machine-gun fire. In addition, the Canadians were using the terrible Ross rifles that constantly jammed. German stormtroopers, led by an officer, emerging from a thick cloud of gas and heading towards British/Canadian soldiers. 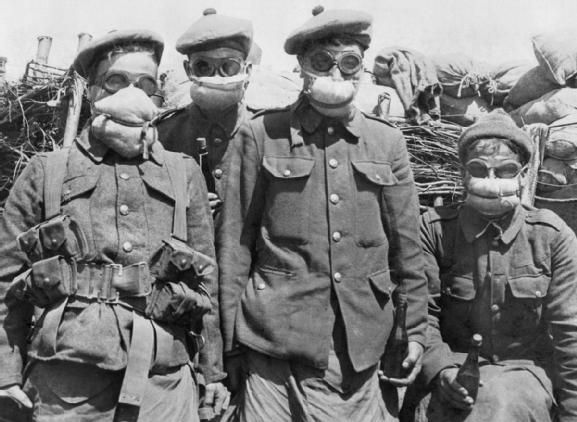 Soldiers wearing early gas masks—essentially goggles plus cloth/gauze soaked in urine strapped to their faces with thin belts. The Battle of Bellewaarde is generally what historians consider to be the end of the Second Battle of Ypres because by its end the Germans were forced to retreat. There were two more battles in the area and then the Third Battle of Ypres, aka the Battle of Passchendaele occurred in 1917. 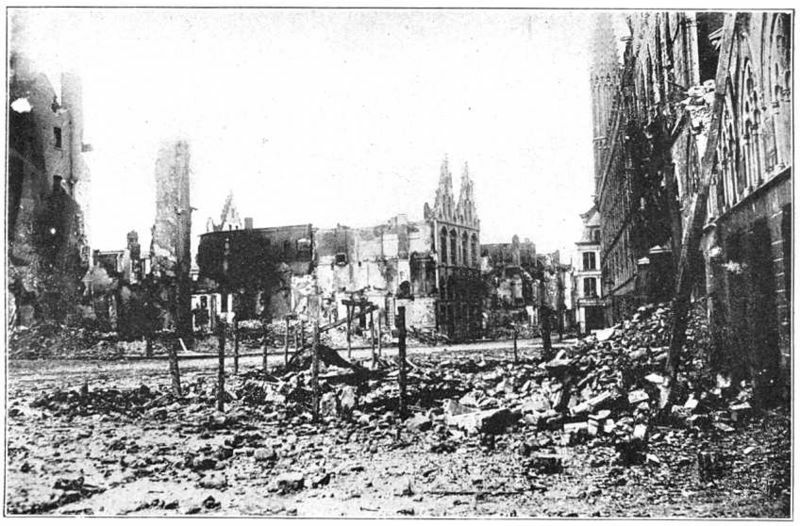 The city of Ypres had been leveled. The Allies had actually more casualties than the Germans (70000 vs 35000). Moreover, this battle marked a dramatic shift in WW1 warfare. The introduction of lethal chemical weapons led to the development of gas protection, Allied gas attacks, (the Battle of Loos in September 1915 marked the first usage of an Allied gas attack against the Germans), and the eventual use of worse gases. Click the infographic for a larger image/to learn more! When it was all over more than 2000 Canadians were dead and there were 6500 casualties. However, their success in holding off the Germans instantly gave the Canadians a reputation for being badasses (technical term) on the battlefield—a reputation which would be proven time and time again as the war waged on. * Don’t let incorrect labeling fool you! Most pictures you see online of Canadians in the Second Battle of Ypres are actually either from the Somme or Passchendaele. I imagine people were too busy freaking out about being gassed to take pictures. 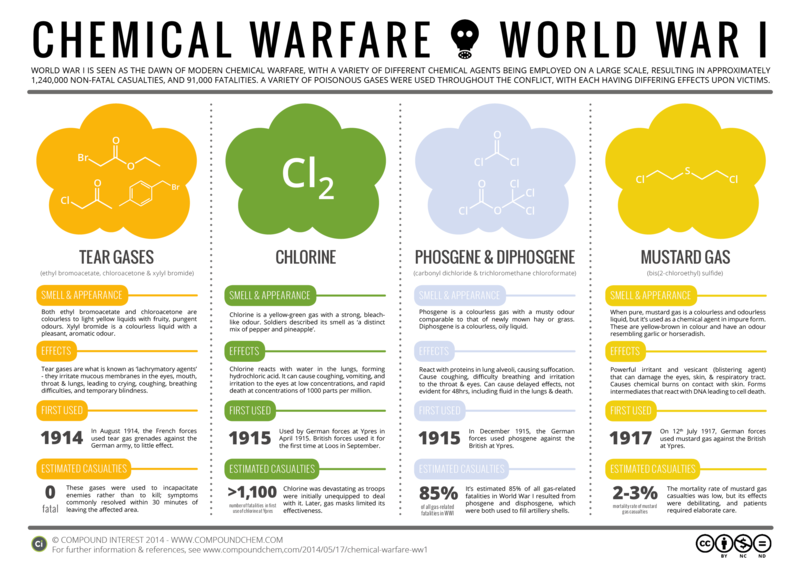 Chemical warfare is so ugly. I remember when I first learned about WWI and all the gas attacks. I also remember how depressing it was to learn how long groups of soldiers had to hold the line in those trenches without taking any ground. I am so glad that I am not in a war! Depressing is probably one of the best ways to describe WWI. I can’t imagine what it must have been like for those who lived through the war. It never ceases to amaze me how humans have found different, gruesome ways to kill one another over the course of time. I am very grateful as well to not be in a war! I’m old enough to remember seeing WWI veterans in Welland in the 50s. They were poor and lived in rooming houses mostly, spending their days at the Legion or taverns. Most had bits missing: legs, arms, facial features. One was missing his lower jaw, and looked like a rat. Needless to say, they could not fully participate in society, but were respected for their sacrifice. If they were still able to work, they might be given government jobs like Lock Keeper,etc. Those with “shell shock” were of lower status because they didn’t have bits torn or burned off.